Mountain Hardwear Fluid Race Vest - in Apr 2019? When running or hiking, the last thing on your mind is keeping supplies safe during the journey. Car keys, water bottles, and granola bars can weigh down the journey. Moutain Hardwear has created a comfortable and lightweight solution in its race vest. Place all your must-have items in the various storage pockets of the vest, tighten or loosen the straps to reach the perfect fit, and enjoy a hands-free journey! 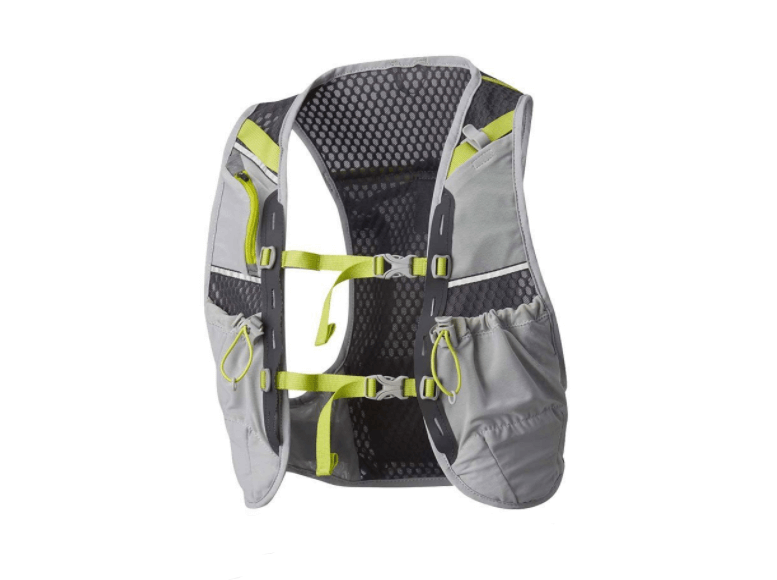 The Mountain Hardwear Fluid Race Vest is a must-have for runners and/or hikers. With multiple adjustable pouches, pockets and zippered compartments, this vest can be loaded down and still not weigh you down. Carry your keys, smartphone and water bottle in the front of the vest, and store a rain slicker, gloves, and extra food in the bungee pouch on the back of the vest. This vest is made with industry standard mesh lining, and then some. Mountain Hardwear keeps the vest lightweight by inserting even thinner stretch mesh into the vest, serving as pockets. This allows for extra-large packing space with mesh that stretches, without tearing or losing shape. Even after going through a wash cycle or two, the elasticity holds up quite nicely. The comfort of this runner’s vest is evident as soon as it is put on. With straps that allow for tightening the vest to the body and the lightweight feel, this vest basically contours to a body. With lightweight material and breathable panels, this vest shouts comfort. Extra wide shoulder straps ensure even weight distribution. The pockets have cinch cords to hold items in place, and the two wide chest straps that hook in front of the vest help keep the vest tight against the torso. The vest comes in two unisex sizes, S/M, and M/L. The small/medium size fits torso sizes between 16.0 - 19.0", while the medium/large is created for those with measurements between 18.5 - 22.0". It is reported that the vest runs small, but with the adjustable shoulder straps, it can be tailored to give that perfect fit. Though it is made with super thin meshing, the vest is also made super tough. Lost lasting use has been received from this running vest, even after cycles through the washing machine. It was made to withstand many runs and hikes. Load down the pockets with no fear, as this vest withstands the added weight, and is slow to tears. The product is not meant to be used with any accessories. There’s not much variety in color choices with this product. In fact, there is one option- a primarily grey vest with orange safety reflective straps and two small strips on each shoulder. This vest isn’t really attention grabbing and is without bells or whistles, but what it lacks in style, it makes up for with the price. The pockets are accessible from the top and front of the vest, allowing for easy access without slowing down your pace. When making the purchase of the Mountain Hardwear vest, it may come as a big surprise that the price is actually lower than average. In fact, this multi-purpose running vest, among all the major manufacturers, is the cheapest on the market. Luckily, in this case, cheaper really is better! - Extra wide shoulder straps ensure even weight distribution. So, while the Mountain Hardwear Fluid Race Vest is the cheapest on the market, it is rich in extras! Safe, secure pockets in various sizes are available to carry water, gloves, a lightweight rain jacket, cell phone, and keys, etc. 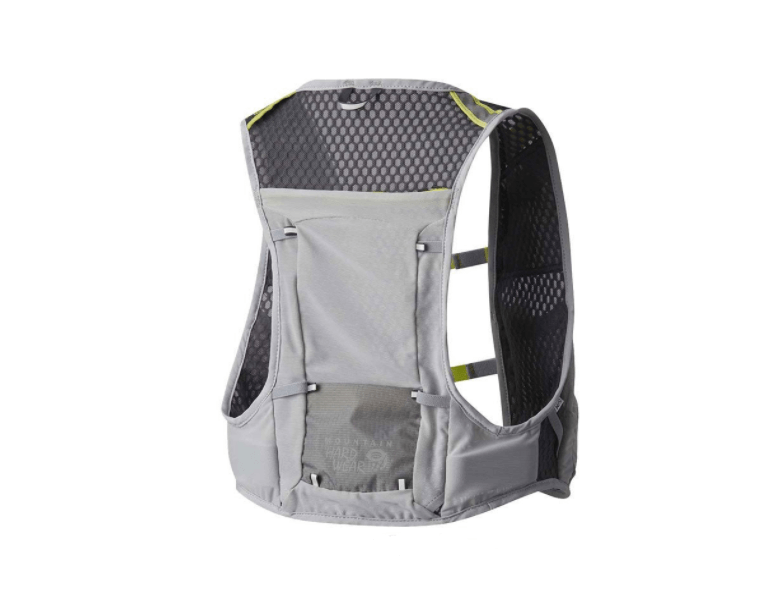 The vest does a good job of allowing easy access to pockets and compartments, all while not weighing down your run. Long lasting, strong yet lightweight mesh linings, sturdy straps and safety reflectors round out this necessity for the avid runner or hiker. This vest has been discontinued.